When I turned 30 I made a decision: By the time I’m 40, I want to be able to say I’ve been to space. There’s got to be a way, and I’m going to find it. Somehow. This site will follow my journey of discovery as I find out about what options there are for getting astronauts into space, what the future holds for commercial space flight and how you might get a random girl from East London up there too. 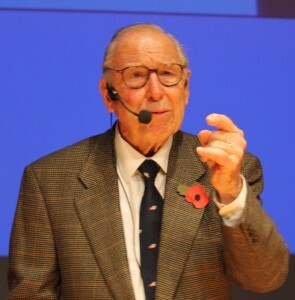 Captain James “Jim” Lovell, a veteran of four space flights, was part the Apollo crew that flew closer to the Sun than any other, and also holds the unfortunate accolade of being the only person to fly to the Moon twice and never step foot on it. At 87, he’s starting to look a little frail, but that doesn’t stop him holding court for over an hour in a room packed with space enthusiasts. I’m back in Pontefract for the latest in the incredible series of Space Lectures and I, like the rest of the audience, am totally captivated by Captain Lovell. “There are three types of people in the world”, says Lovell. “Those who make things happen, those who watch things happen, and those who wonder ‘what happened?”. Lovell certainly has had a life filled with adventure, so I’d have to conclude he fits squarely in the former group. Lovell took part in the first astronaut selection process in 1958, making it down to the last 32, but he lost out to John Glenn, Wally Schirra and the other five guys who went on to become known as the Mercury 7. “I don’t know why” he says, with a glint in his eye. When the second astronaut selection process took place – this time for the Gemini programme – he applied again. “By gosh I was selected” says Lovell, with a hint of excitement still present in his voice. “It was the golden age of our space activities” he says, “the whole population was excited about space”. NASA calculated that maximum time it would take to get to the Moon and back and based the length of the Gemini 7 flight on that to test the body’s reaction to space. At just a fraction less than two weeks in duration, Gemini 7 was the longest of the Gemini missions. The flight had 23 experiments on board “and it was really bad news!” says Lovell, reminding us that the size of the craft is “smaller than a VW”. One of the experiments was to look at the change in calcium level in the body, and whether that changed when they were in space. You need calcium to keep your bones strong on Earth, but what about in microgravity where your bones are not subjected to the same force? Would the calcium just “flow off”? For two weeks before their flight everything about them was monitored, how much they ate, drank, and even how much they perspired. The team knew exactly what food they were eating in space and then measured everything for 10 days after the flight while they were in isolation in order to see if there was any change in their calcium levels. The experiment sounds arduous, to say the least, and Lovell wryly announces “Ladies and gentlemen – I can tell you that a two week mission is not the right length of time to do a calcium balance study”. He’s right of course, and studies on calcium balance in space continue to this day, with Scott Kelly and Mikhail Kornienko currently on the space station carrying out a year-long mission. There were important things learnt on their mission. Muscles become weak and microgravity has an effect on blood flow and the heart. “Our heart rate was 10 beats per minute slower, and the volume of blood decreased” says Lovell. First the crew was told that they should drink more water, but actually you don’t need quite so much blood in space, since it doesn’t pool down in your feet and legs like it does on Earth. 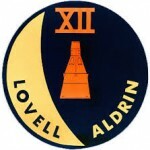 “My second flight was kinda different” says Lovell, talking about Gemini 12, the final mission of the Gemini programme. On Gemini 4, Ed White did the first US spacewalk, he went out attached to oxygen supply, and he floated. On Gemini 9, 10, and 11, NASA tried to get astronauts to do work while on a spacewalk. “They all failed” says Lovell, “their bodies became overworked”. “We had forgotten the third law of motion, for every action there is an equal and opposite reaction”. Each time they touched the spacecraft it would react, and that was causing problems. Some “brilliant engineers” came up with the idea for the neutral buoyancy lab – or in those days, a swimming pool with a mock-up space module in the water so they could practice spacewalks. Lovell recalls crewmate Buzz Aldrin in a spacesuit in the pool being reminded “don’t swim” – because in space that would of course be impossible. This allowed them to plan the foot and hand holds on the craft, and “it worked quite well” says Lovell. Gemini 12 was the first mission to show that extravehicular activity was feasible. Nowadays training in huge pools is a standard part of training for astronauts. Lovell’s third flight, Apollo 8, was never meant to fly to the Moon, but “1968 changed it completely”. The US received information that Russia was going to fly a crew around the Moon in the autumn of 1968, but they had several failures during the Zond programme. “The re-entry wasn’t right” says Lovell, referring to Zond 4. The Russians successfully sent Zond 5 around the Moon in September 1968 with a crew of tortoises, flies, worms and plants, but there were still some concerns and this led to many arguments back and forth around the safety of a crewed mission. During this time, things were progressing in the US, though not entirely as planned. Grumman, who were building the Lunar Module (LM) announced that they “can’t make and deliver the LM in 1968”. This caused a bit of an issue for Apollo 8, which was slated to test the LM in Earth orbit, and take the Command Module (CM) to a high altitude so that they could reach Moon-return speeds and test the heat shield on the CM. “Without the lunar module, what should we do?” asks Lovell. It was decided that if Apollo 7 tested the CM and it was a successful test, Apollo 8 would be changed so that it would go all the way to the Moon, circumnavigate it, and come back. It was in summer 1968 that they got word that the mission had changed, and they were scheduled for launch in December the same year. “I spent many a day at MIT learning new guidance systems to navigate to the Moon” says Lovell. “1968 was kinda a bad year, especially in the US” says Lovell, “there was Vietnam, riots, assassinations” so it was an important mission in terms of morale. “We were looking for landing sites on the nearside of the Moon” explains Lovell. “We saw this Earth come up from the lunar horizon – really a fantastic sight – the whites and blues of the Earth, the tan of the deserts”. 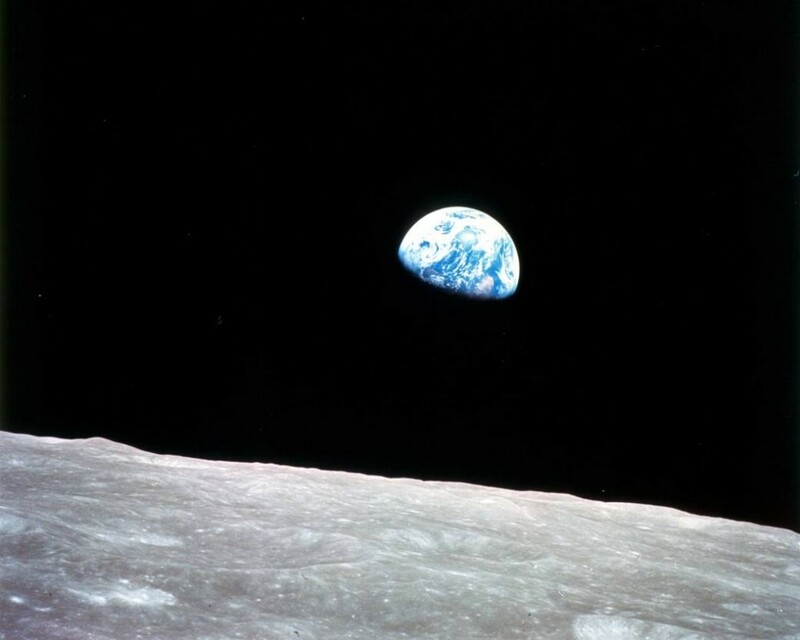 The resulting photograph – famously known as “Earth-rise” – springs to instantly to mind, but here is someone remembering seeing that sight for real. “Earth” he says “just 240,000 miles away, looked totally uninhabited, just tucked away by a normal star, tucked in a normal galaxy”. Lovell says that Apollo 8 is the most significant flight of his career, and since he was commander of the drama-filled Apollo 13 mission, I’m quite surprised to hear that. 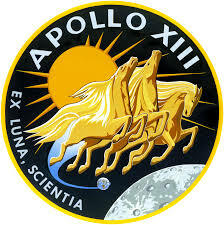 “Apollo 13 was a flight that was plagued by bad omens from the beginning” he begins. “Years before we flew, the company producing the oxygen tanks dropped one on the floor, it was refurbished and it should have been fine”. The crew did a countdown demo test, with the big booster, all consumables, but no fuel. Everything was timed down to zero to check all the systems worked. The test was perfect – “no problems” – but after the test, as the ground crew tried to remove the oxygen tanks, one tank wouldn’t come off. It was that tank, the one that had been dropped all those years earlier. Inside the tank there was a little heater that was used to burn a little of the oxygen off, the ground crew decided that they could save a bit of time by leaving the tank where it was and burning off the oxygen using the heater. One problem, in flight power for the rocket systems was 28V direct current, while the ground power was 65V DC. This high voltage welded the contacts from the thermostat together, meaning that instead of shutting off the heater when the temperature was too high, it was actually able to heat the inside of the tank to around 900 degrees Fahrenheit, melting the Teflon inside. The result was that on launch day, when they filled this tank with oxygen, “it was a bomb waiting to go off”. That wasn’t the only piece of bad luck. The crew were exposed to measles, and while the others were okay, Ken Mattingley, a bachelor, was not immune. He was dropped from the crew and replaced by Jack Swigert. “It sort of felt like a bad omen coming true” says Lovell, “but we had a good guy with Jack”. So we get to launch-time for Apollo 13 – 13:13 CST on April 11th 1970. The first stage was perfect, and was jettisoned fine, and then the central engine in the second stage shut down. 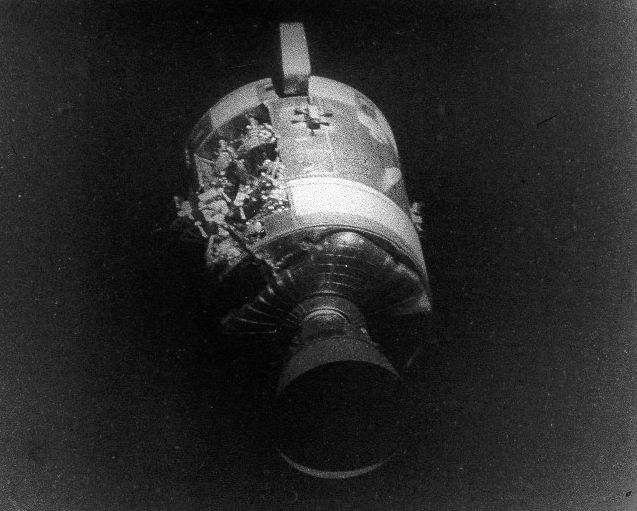 It was a good job as Lovell says, “if not it would have disintegrated and taken the other four”. The crew orbited Earth and everything seemed okay, so they set off a free return course to the Moon – whereby you “coast” at 24,000mph all the way to the Moon and then the Moon’s gravity helps to swing you back for a safe return to Earth. All the Apollo missions, from 8-17 started on a free return trajectory. 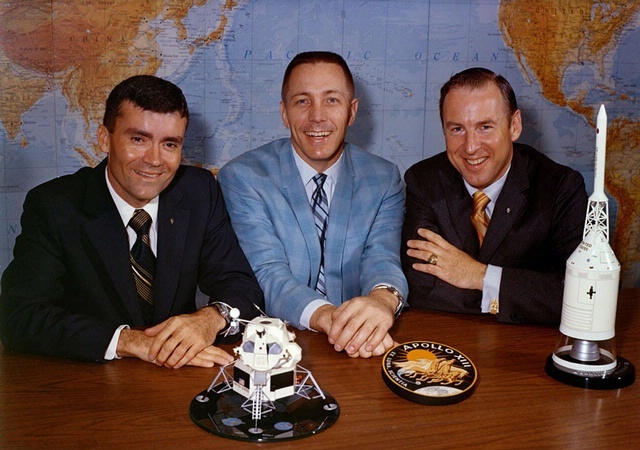 Apollo 13 crew – Fred W. Haise, Jr., John L. Swigert, Jr. and James A. Lovell, Jr.
Mission control came through on the radio to let them know that if they wanted to land at Fra Mauro they need to change the attitude of the spacecraft slightly. This now meant that if an engine failed, their course would take them to the Moon, they’d go round and come back to Earth, but they would be 40,000 miles away – too far to be caught be Earth’s gravity. On April 13th (of course!) the now famous explosion occurred. 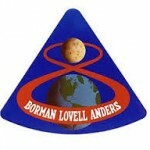 Once again Lovell was faced with a change to his mission, except this time the change was “from landing to survival”. The crew wondered if they had been hit by a meteor and set about trying to close a hatch so that they could maintain pressure in their part of the craft at least. Jack Swigert tried several times but couldn’t manage it, neither could Lovell “so we put it on the catch and tied it down” he says. 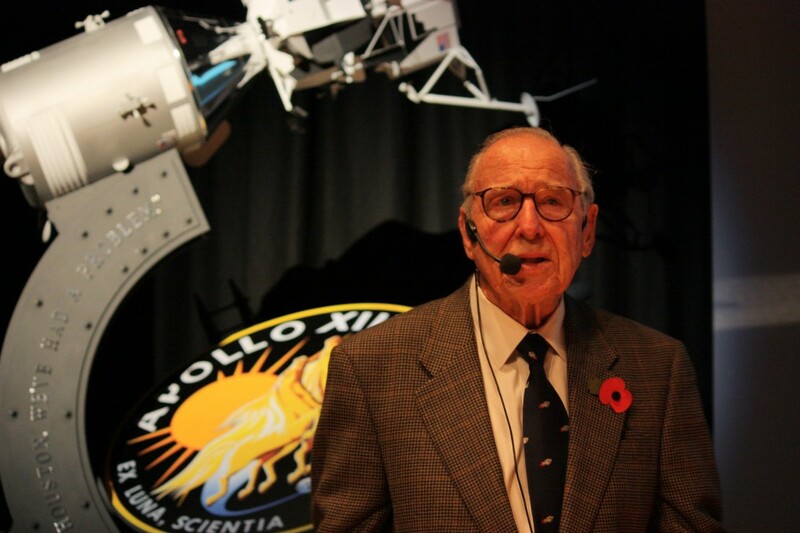 “We realised that we weren’t dead yet, so it wasn’t a meteor” says Lovell, deadpan. Out of the window he could see a substance leaking out. “It dawned on me that we were losing oxygen” he says, “the gauge on one tank was at zero, and the needle on the other was coming down”. “I knew the only way to come home would be to use the lunar module as a lifeboat” he says. Mission control couldn’t – indeed didn’t – believe it at first, after all, there are so many back-ups in place. They lost telemetry, then radio for a while, then mission control decided “you know what this is? It’s a comms problem”. Perhaps it was a solar flare they thought, that’s probably the only problem, “but we knew what had happened” says Lovell. “The LM is a very fragile device” says Lovell, “the material is so thin you could punch a hole through if you wanted too, and it was designed to last for 45 hours, with two people”. “After the explosion, I kept counting the crew” he says, “one, two, three”. The first thing the ground came up with was to get them back on a free return course so that they would “somehow intercept Earth”. Still, that sounded better than skimming round the Earth at 40,000 miles altitude, returning to the Moon, and going round and round, he says. “Is the command module dead?” they asked. “Yes” replied Lovell. “Well you can use the lunar module as a lifeboat”. “Yes I’ve already thought about that” said Lovell. 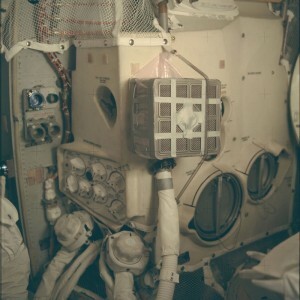 Using the attitude control system (ACS) on the lunar module they tried to change the spacecraft’s attitude, but it was never designed or tested to work when still connected to the command and service module. This added 60,000lbs of dead mass that wouldn’t normally be fighting against the ACS on the LM. The centre of gravity was in the wrong place and that caused problems, but the apparently unflappable Lovell merely comments that “you’d be surprised, how quickly you learn when you’re in trouble”. The next crucial manoeuvre involved blasting the engine while they were on the far side of the Moon in order to speed up their return time. But there would be no communication connection with mission control from behind the Moon, so it was incredibly important that they noted the instructions and timings down correctly before they lost contact. Lovell, as Commander, asked for the rest of the crew to listen for instructions too, to make triply sure they took them down correctly. “Are you ready to copy?” said mission control, and Lovell realised that his two companions weren’t even listening. “They were so interested in the far side of the Moon that they forgot we were in trouble” says Lovell. “I reminded them, if we don’t get home, you won’t get your films developed!” somehow still able to make light of their situation. They switched on the engine for four minutes, and then “we switched off the ‘exotic’ systems that you can do without” says Lovell, listing off guidance computer and autopilot among them. “We were left with only the radio, and a fan to keep air circulating” he says. “Things were kinda quiet”. “When it’s quiet and you’re in a tight spot, you start to think” says Lovell. Swigert worried that they might exceed escape velocity, and Lovell reminded him they were back on the free return trajectory. “Don’t worry, we have it made” he remembers saying, “but I was wrong”. Returning to Earth from the Moon is a tricky business, you have to return at a specific angle, no less than 5.5 degrees, no more than 7.5 degrees. “If you come in too shallow, you skim off, too sharp, and you’ll burn up”. As it turned out, they were now set to miss Earth not by the original 40,000 miles they were worrying about, but by 60,000 miles. Something had to be done, and without the help of those “exotic” systems they’d been forced to switch off to preserve power. 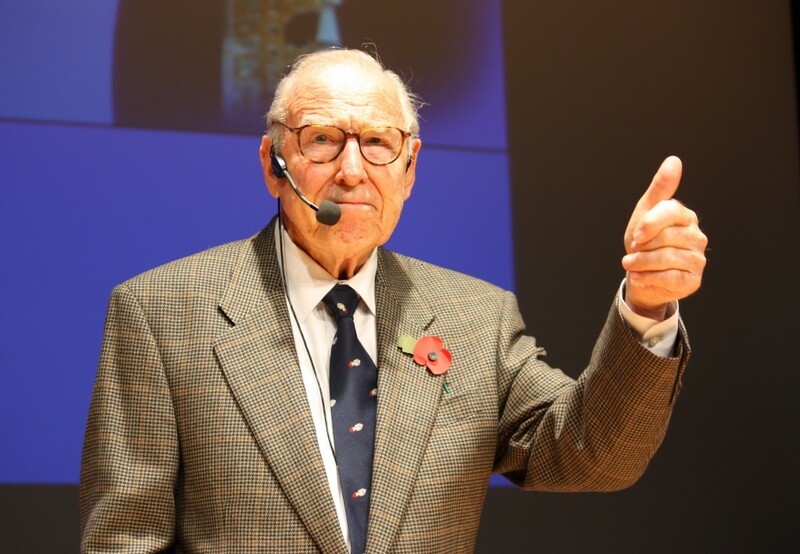 In an unusual piece of good fortune for Apollo 13, there was one emergency manoeuvre, tested on Apollo 8, that could help them – and as luck would have it, it was actually Jim Lovell who had helped to develop it. 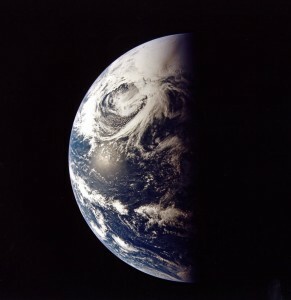 The procedure involved getting Earth in the window of the LM, and using the Earth’s terminator (the line when day and night meet), as a navigational aid, allowing them to fire the engine and change course, as famously (though somewhat overdramatically) depicted in the film ‘Apollo 13’. More accurate was the portrayal of the issue of the crew being poisoned by the carbon dioxide in their own exhalation. The CO2 scrubbers in the LM were round, but in the control and service module they were square, and since you (in this case literally) can’t put a square peg in a round hole, a team on the ground worked hard to find a way of converting one into the other, using filters, duct tape and other bits of kit available to the crew in order make it work. They sent up these instructions and the crew was able to solve the problem. There were still concerns about landing. Had the heatshield been damaged? 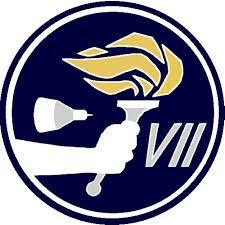 Would the pyrotechnics deploy the parachutes after having been so cold? Thankfully the the crew splashed down safely, ready to be picked up by the aircraft carrier US Iwo Jima. Once onboard they radioed back to Johnson Space Center in Houston – “they were happy, but probably ripped up all the obituaries they wrote for us” says Lovell. 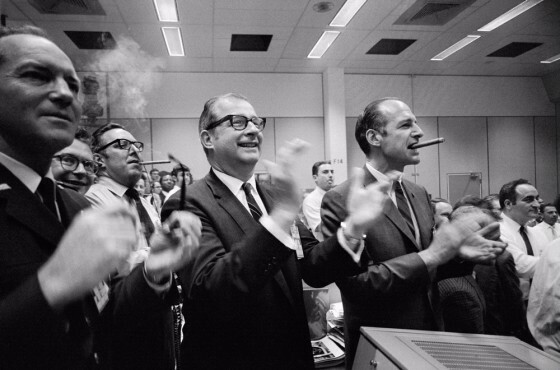 Dr. Thomas Paine (center of frame) and other NASA staff members applaud the successful splashdown of the Apollo 13 mission. For years Lovell was frustrated and disappointed not to have stepped foot on the Moon, but now he’s had a change of perspective. “Apollo 13 brought out what we could do in a crisis” he says. He explains how he often wonders what would have happened if Apollo 13 had been successful. “It dawned on me that perhaps the best thing that could have happened was the explosion”. “Without the explosion, there would be no ‘Houston we have had a problem’, no ‘Failure is not an option’”. “We’d have picked up some rocks, said some forgettable words, and been forgotten”. 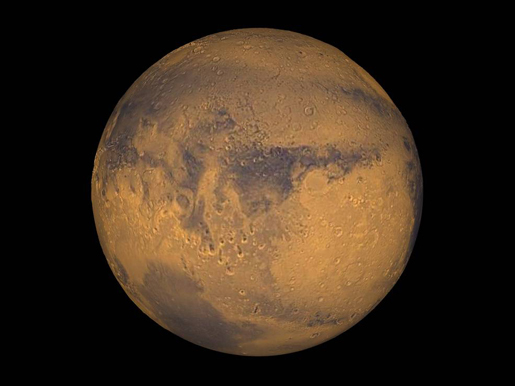 Liquid water on Mars – does it deserve the fuss? It’s been an exciting 24 hours for the online (and indeed offline) space community – first there was the “Super Blood Moon”, where a lunar eclipse allowed the Moon take on an eerie deep red colour in the early hours of Monday morning, and then NASA revealed what its much-anticipated big announcement trailed as “Mars Mystery Solved” was all about. 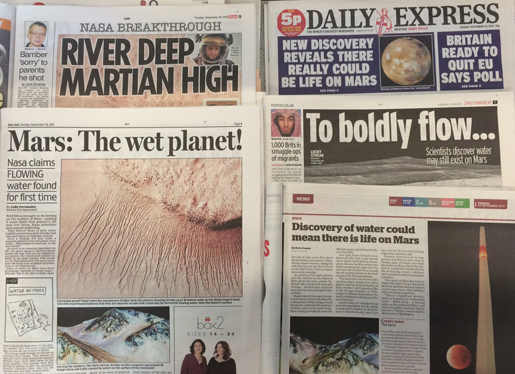 So, water on Mars, but that’s old news isn’t it? Well, yes and no. In 2008, NASA’s Phoenix Mars Lander confirmed the presence of water ice near the surface of Mars, but it’s liquid water that people are especially interested in, as this is considered to be a key to life. Hasn’t Mars Curiosity found liquid water on Mars? In 2013, Mars Curiosity rover’s SAM (Sample Analysis at Mars) instrument found that a sample of Martian soil it had scooped up and analysed was 2% water. While not liquid, it was noted as being a relatively high percentage of water. In April this year (2015), a paper was published that suggested there might be (transient) liquid water below the surface of Mars at Gale crater, according to readings from the Mars Science Laboratory. For years spacecraft orbiting Mars have sent back images showing valleys, streaks, and gullies on Mars – they all looked like water was causing them, but there was no proof. Around four years ago scientists discovered features that they have named “recurring slope linnea”, which change with the seasons and temperature. These recurring slope linnea (RSL) – basically large streaks like you might expect to see if water was running down a mountain say – can be hundreds of metres long. 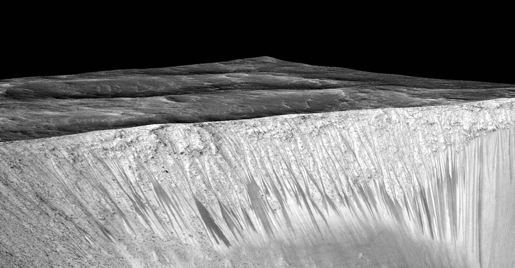 These “streaks”, pointed to water being the culprit, but “there had been no evidence of water” says Dr Michael Meyer, lead scientist for NASA’s Mars Exploration Program – who pauses for dramatic effect – “..until now”. An instrument called CRISM (Compact Reconnaissance Imaging Spectrometer for Mars), on the Mars Reconnaissance Orbiter, has been used to analyse the chemistry of the streaks when they appear, and the results of this analysis are what is causing the current excitement. There were two ways the scientists could confirm that the RSL are formed by liquid water. The first would be to use the spectrometer to detect liquid water absorptions on the surface, and the second would involve the detection of hydrated salts precipitated from that water. The results published yesterday show the presence of hydrated perchlorate salts in the RSL regions, thus indicating the presence of water – though even when liquid it would be more of a salty mix than something you’d get from the tap! We know that Mars has undergone some huge changes in its lifetime. Around three billion years ago it is believed that perhaps as much as two-thirds of the northern hemisphere of the planet was ocean, but Mars suffered a major climate change event and lost its surface water. The rovers that we have sent to Mars are finding a lot more humidity in the air than expected, and the soils are moist and hydrated. But how do we get from water in the atmosphere, to flowing water? The preferred theory revolves around the idea of “deliquescence” (yeah, I had to look that one up too). What this means is that the perchlorate salts, which are found on Mars, like to absorb water – so much water in fact that they can at certain times (e.g. when it’s warm enough) become a liquid solution, which trickles down crater walls and other slopes creating the RSL we observe. Perchlorate salts lower the freezing temperature of water by the way. Other ideas that have been put forth are that the water could come from surface or sub-surface ice melting, or local aquifers. It could be that there are different mechanisms at different locations around Mars. 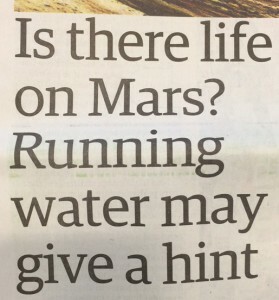 So now we’ve found water, we’ll find life soon, right? “All life on Earth needs liquid water to grow or reproduce. Life can be dormant in the dry state” he says. “Brines of sodium chloride (normal salt) are suitable for life even at complete saturation of that salt at -20ºC” – that means life can survive in really salty conditions, and studying extremophiles (organisms that can live in extreme conditions) as Dr McKay does, is a good way of understanding the limits of life. Ah, this doesn’t sound good. It’s not time to get the “Welcome Martians” party banners out then? Hmm. So basically, while this is fascinating research all the same, the “water” found on Mars is so salty it probably couldn’t sustain life (as we know it) – and even the Nature Geosciences paper says that: “If RSL are indeed formed as a result of deliquescence of perchlorate salts, they might provide transiently wet conditions near surface on Mars, although the water activity in perchlorate solutions may be too low to support known terrestrial life”. I guess we best keep on searching then, and take those headlines with a pinch of (perchlorate) salt, eh? 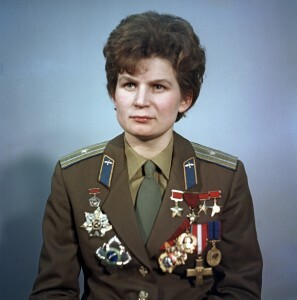 Cosmonaut Valentina Tereshkova – first woman in space, and only female to have done a solo spaceflight – was always going to be on my list of heroes. So as I walk into the large IMAX auditorium at the Science Museum and take a seat for a special Q&A session with her, I can barely sit still. Projected on the screen is a huge black and white photo of her in her space helmet. It’s a wonderful image, and I hear the people in the row behind me echoing that thought. She enters, with Science Museum Director Ian Blatchford, and I pop on the headphones connected to a small device that will supply a translation of her words. It’s safe to say I’m excited about what I’m about to hear. And I’m not disappointed. In fact, I’m mesmorised. Valentina Tereshkova is cool. She’s funny, occasionally self-deprecating, and she’s also kinda badass (if that’s not too crude a word to use about a living legend). Here she is sharing her story, right in front of me. I did my best to take notes so that I could share it with you. “Every child thinks about what they would like to be”, she says. “I was from the war generation, we dreamt about peace – we wished for a time we didn’t have to see our parents cry”. Tereshkova explains that when she was young, she lived quite close to a train station, and would watch the trains go by on the way to Moscow and other places. “They must be so lucky” she thought, referring to the fact they got to see so much. Her mother was sceptical about her following this line of career ambition. “Maybe something different?” she suggested. After Yuri Gagarin flew to space, there was no boy or girl who didn’t want to be a cosmonaut she says. She joined a sky-diving club and all the sky-divers and parachutists thought that they should be the ones to become cosmonauts. On the other hand, all the pilots were convinced that they should be the first cosmonauts. 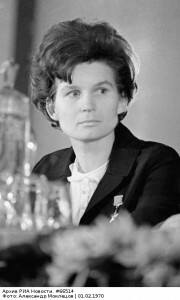 Tereshkova was invited to Moscow, where she underwent rigorous check-ups and tests, before being recruited as a potential cosmonaut. It was all highly confidential. She said goodbye to her mother, and made up a story about participating in a parachuting tournament. When the newly selected cosmonaut candidates passed Gagarin in the corridor, “we looked at him as though he was God” she says. “We tried to touch his sleeve” and he asked them “why are you trying to stroke me? !” They explained their story and he showed interest in them. In the 1960s there had been years of confrontation between the US and the USSR, and there was a lot of competition with regard to space. Tereshkova said that they knew the US was also training women, “but the USSR outdid America again”. On 16th June, 1963, she went up into space. They had just two years to train – “it was rather difficult, a lot of work” she says, “and we had very limited time”. “We had to say bye to ‘living’ on Earth – we were at Star City, 40Km from Moscow – there were no weekends, and no entertainment” she recalls. Tereshkova was due to fly the week earlier than she did, but there was a lot of solar activity and so the flights were shifted to a later date due to the additional radiation risk. Ahead of her launch, on 14th June, Valery Bykovsky launched on Vostok 5. As with Vostok 3 and 4, the two craft came close to one another and established radio contact in space. 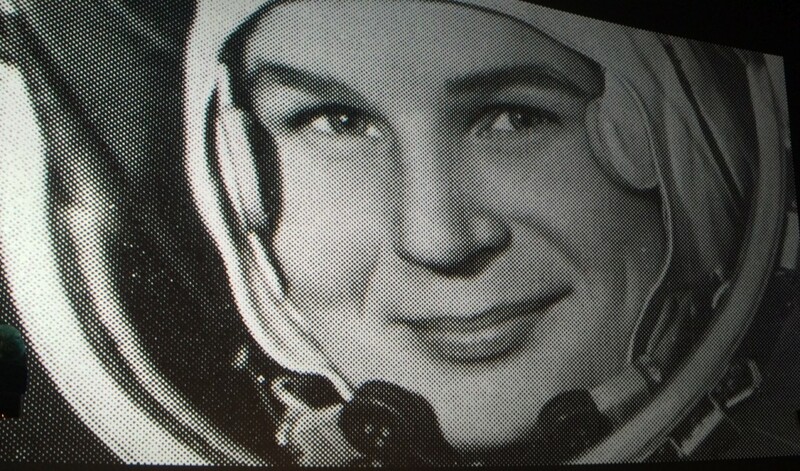 Tereshokova’s Vostok 6 launching on 16th June, and when they finally made contact she said “Valery, let’s show that we are okay and we are enjoying the view, let’s sing a song”. “I am not a singing bird” came Bykovsky’s response, “you sing, I will be listening”. Tereshkova says that she and Bykovsky are still in touch to this day, and when she sees him, she reminds him that he wouldn’t sing with her, “I still don’t want to sing with you!” comes his response, but the ways she tells it, it sounds as though it’s all in good humour. When Tereshkova flew over Yaroslavl Oblast, where she was from, she felt emotional knowing that her mother was there, but quickly realised that she was so busy with the flight that there was “little time for emotion”. At the time that she flew, her mother, Elena Tereshkova, had no idea that her daughter was a cosmonaut (her father, Vladimir Tereshkov, was killed in Finland while Valentina was just two years old). When one of the neighbours came round shouting “Elena! Your daughter is in space!” her mother calmly replied “you must be dreaming, she is skydiving”. 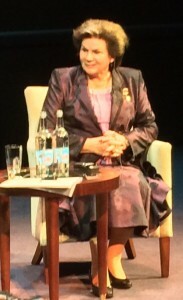 In fact Tereshkova had written ten letters before her trip, and asked for them to be sent on her behalf. Some sources claim that her mother had been reading one of Tereshkova’s letters about the sky-diving tournament when she received the news from her neighbour. The family didn’t own a television at the time, so it was only when the neighbour brought Elena round to see it for herself on television that she found out. “..but she was skydiving, she had to parachute” he added. 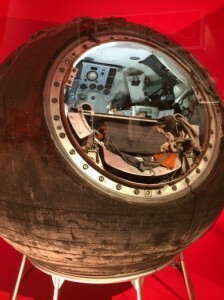 Vostok craft are different from the current Soyuz capsules – rather than land inside the capsule, you had to eject at around 7Km up and parachute down. Bykovsky landed in Kazakhstan, but with no aerodynamics, “you could land anywhere” says Tereshkova. She ended up landing in a field in the Altai Region. “I had to be different, as a woman” she says with a smile. When she landed in the fields, with the aid of her parachute, the women in the field came and said “come on, we will feed you”. She wanted to give them something, and so she handed out some of the space food that she had, which got her in some trouble. “I gave some away – we don’t have to tell everyone” she recalls answering when the agency asked her how many tubes of food she had. Tereshkova was lucky to have landed at all. A mistake was made with the navigation software on Vostok 6, which, had Tereshkova not spotted it in time, would have seen her launched further and further into space with no way back. Thankfully she did notice, and Sergey Korolev (Head of the Soviet Space Agency) and Yuri Gagarin calculated a new landing algorithm, which she inputted, ensuring she did get back. Tereshkova says that Korolev was known for “scolding us as much as loving us”. He gathered everyone to find the culprit – the person responsible for the mistake, and found them, but Tereshkova helped save him. On her return, Korolev said “My darling seagull, don’t tell anyone. Everything went well”. (“Seagull” – or “chaika” in Russian – was her call-sign). “I kept mum” says Tereshkova, on the condition they didn’t punish him, but on the 30th anniversary of her flight Evgeny Vasilievich, the engineer in question, chose to come clean about it saying “people need to know the truth”. Tereshkova says she was “horrified” when he did this, as she had promised Korolev never to say anything. Tereshkova explains that the cosmonauts of the time didn’t realise the level of “popular love” that they would receive upon their return. When she had her daughter she got many letters telling her that she should give her daughter a “space name”. Instead she honoured her mother and called her daughter Elena. “She’s a doctor – my happiness, my joy” says Tereshkova. She speaks of the children and grandchildren of other cosmonauts and we learn that Alexei Leonov’s daughter “treats her parents well”, which you can tell is important to Tereshkova. “Our space fraternity tries not to betray each other” she says, “we stay loyal”. Sergey Korolev had the idea to fly an all female team recalls Tereshkova. She indicates that they had been training and preparing for such a flight around 1965, but in 1966 he died. “It was a huge tragedy to lose such a designer, scientist, visionary” she says. When people looked at his plans “there was pure chauvinism” she says, “we were pushed aside – it was unthinkable to send women”. She tried to let it go – “we were bitter and sad, but still wanted to continue – there was a new craft, Soyuz”. But with the tragedy of Vladimir Komorov’s flight – Soyuz 1, and then Soyuz 11 ending in disaster, with the capsule depressurising during re-entry preparations, killing all three crew members, the female cosmonauts were told “we won’t be risking your lives”. They were dismissed. “This is our sad story” says Tereshkova. 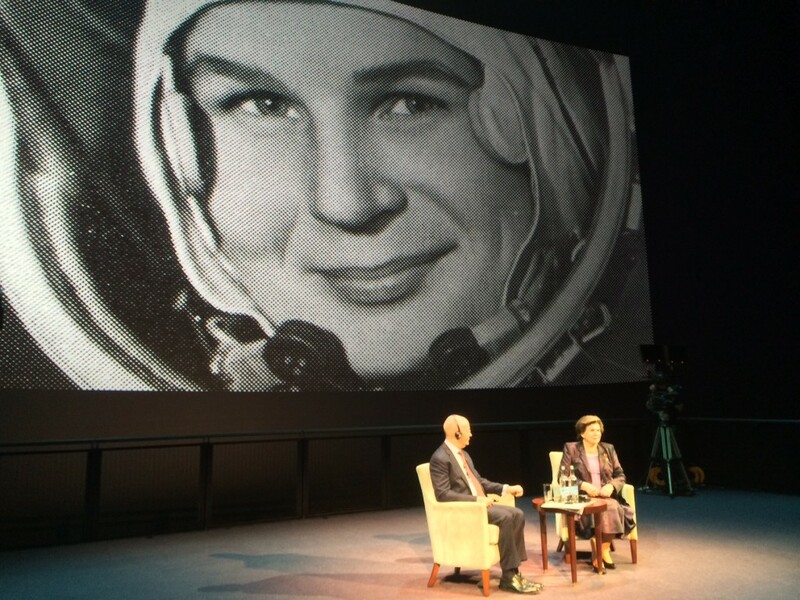 During the opening celebrations for the Cosmonauts exhibition, which is currently on at the Science Museum in London, Museum Director Ian Blatchford and Tereshkova made a deal to go in to space together. “Ian will sing Russian folk songs in space” she says, “and she will sing English ones” says Blatchford. “Shall we start now?” Tereshkova asks enthusiastically. “Nyet!” replies Blatchford, firmly. “So, you can’t trust a man really, can you?” says Tereshkova, raising a laugh from (at least) the female members of the audience. What of the future? “We desperately need new engines and spacecraft” says Tereshkova. Getting to Mars “could become a reality sooner if scientists from other countries all work together – only then could we do it sooner” she says. “It was my dream to go to Mars” says Tereshkova “I’m quite happy to go there one way, to stay there”. Sergey Krikalev is a softly spoken, humble gentleman. Meeting him, you wouldn’t guess he’s been awarded the highest accolades of both the Soviet Union and Russia – he’s a hero of both. 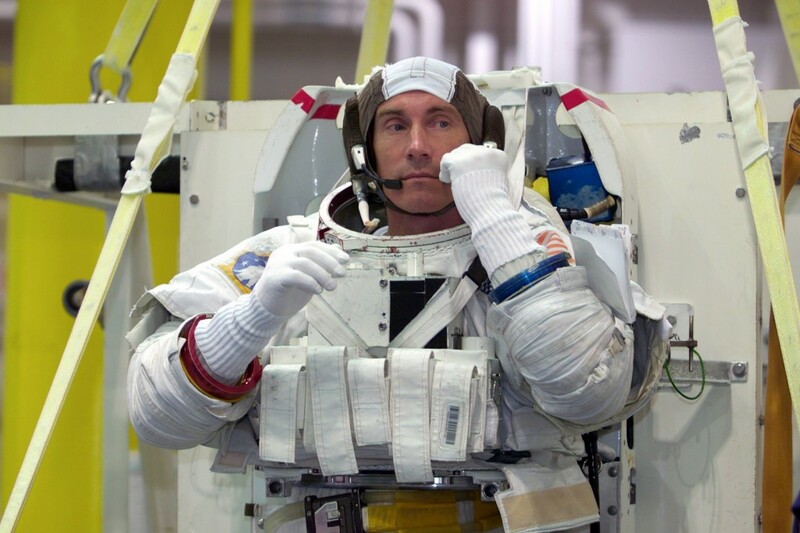 With six spaceflights and eight spacewalks under his belt, he was, until very recently, the holder of the record for most time spent in space – over 803 days…. That’s more than two years spent orbiting the planet. But “I didn’t do it for the record” he says. 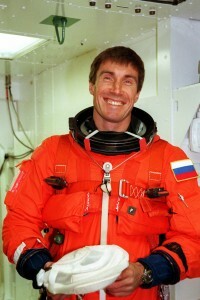 As if that’s not enough, he was the first Russian to fly on NASA’s space shuttle, was part of ISS Expedition 1 – the first construction mission, and is also sometimes referred to as “the last Soviet” on the basis he left the USSR for space, and by the time he came back to Earth, it no longer existed! I first met Sergey at a conference about the International Space Station, held in Berlin in 2012. It was a fascinating event, with representatives from the major ISS partners discussing the benefits of the space station, what an incredible feat of engineering and cooperation it is, and sharing some of the science that had come from it. My friend, cosmonaut Anton Shkaplerov, had just returned to Earth from a six month stay aboard the ISS, his first trip to space. I was keen to hear how he was doing, and after a presentation Sergey gave, I went up to ask him, as head of the cosmonaut office, if Anton was okay. He was fine I heard, and I made way or all the autograph hunters wishing for Sergey to sign their programmes. It was only really then that I realised that I’d spoken to quite the legend in spaceflight (or indeed any) terms, and I wished that I’d been able to talk to him some more. A little later during the conference, at a dinner at a local museum, I found myself walking round the collection of communication instruments and old telephones with Sergey. He was keen to learn about things, to take everything in, and he enjoyed walking and talking. I learned about his past as an acrobatic pilot – a national champion no less – and was keen to hear more about his time in space. He’s humble, fascinating, incredibly smart, and there is a sparkle in those blue-grey eyes as he makes a little joke here and there. I ask him whether they ever had vodka in space. “Vodka in space is bad” he tells me, and I’m not sure if he’s reprimanding me for suggesting that they might be daft enough to risk mixing the highly technical environment of a space station with alcohol. He follows up by saying “but Cognac…”- he gives me a smile and says no more. Like many Russians, Sergey usually looks serious, concentrated. I look through images of him in space, and even there, as he floats around and enjoys the view of Earth, there’s only ever the hint of a smile – except one picture, where he’s dressed in an orange ACES suit, ahead of his space shuttle mission I suspect, grinning widely. I ask him why that is, why he doesn’t smile more, and he tells me that Russians smile when there is a good reason to smile. It’s been three years since I last saw Sergey – his visa for the International Astronautical Conference in Toronto last year didn’t come through in time – so I’m pleased to see him in London at the opening of the new Cosmonauts exhibition at the Science Museum. He sees me, and smiles. I’m happy he still remembers me. What follows is the best tour of an exhibition charting the birth of the space age that you could wish for, until he’s whisked away for a VIP dinner by some important looking Russians (who I later find out are the Head and Deputy of the Russian space company Energia). He points out the Soyuz engine at the entrance, tells me about the sample return mission to the Moon that the Russians carried out even before the US made it there. If you listen to the experts at NASA, they will tell you that all the Moon rock on Earth belongs to NASA – they are the only ones who brought it back. Perhaps that is correct, but we shouldn’t overlook the fact that the Russians also managed to bring back a sample, I’m guessing it’s a small amount of “regolith” or Moon dust – so technically not Moon “rock”. They still have it, explains Sergey, and much research has been done. I discover he has a new role in the Russian space world. He’s working on future missions, looking at possible paths out of low Earth orbit, a post-ISS future. I ask whether this is an area that the Russians are looking into alone, or as part of a new international collaboration, and he tells me that this is an international endeavour. “What about China?” I ask. There have been discussions, he says, but these haven’t come to much as it sounds as though China wants to collaborate on things that would help them, but not necessarily fit with the overall goals of other partners. What about the ISS itself? While the US side is now considered “complete” – there are no more modules to add – Russia was planning to send a new module back in 2013. This never happened, but is still on the books, slated for launch in 2016. 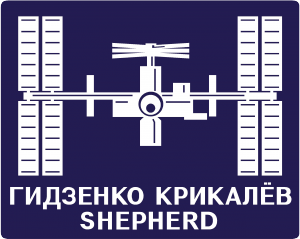 With a new module and docking port, could this make the Russian segment of the space station viable without the US side? (Currently the two halves are reliant on each other for a number of things.) 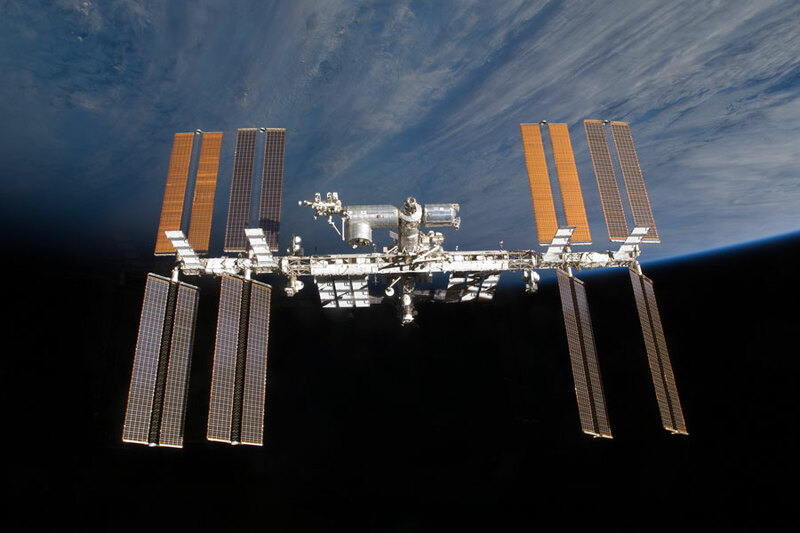 He doesn’t think so, so it seems that when the partners decide to end ISS operations, it really will be the end of the orbital outpost that has hosted people for the past 15 years. As part of the space station generation, I’m a little sad to think of it crashing back through the atmosphere, with anything that doesn’t burn up, likely laying on the seabed forever more. But at least he’s thinking of the future, and despite much change in the upper echelons of the Russian space sector, he seems hopeful for the future and enjoying his work. I will be interested to see where it takes him, and of course, the rest of humanity.